Is it just me, or do you find yourself feeling acutely aware of what was going on a year ago at this time? As we orbit the sun, it’s like we travel through the same place in space where the ghosts of yesteryear linger. It makes me think of tree rings. Another orbit around the sun, and last year’s ring is still within reach and pulsing with energy that pulls you in. Last year at this time, I was really deep into my epic clutter-clearing journey. I decluttered the entire house, leaving no spoon, paper, or screwdriver untouched. Today, I am immensely grateful to last year’s Susan for embarking on that transformational journey. My living space feels entirely different now. There’s no more clutter! I don’t even have a junk drawer anymore! Everything – absolutely everything – my eyes rest upon in my home is there because is serves a purpose or brings me joy. If I didn’t love it or use it, I got rid of it. I walk around the house all the time now marveling about how incredible the energy feels. My living space supports my vision of who I want to be and is no longer bogging me down and holding me back. After finishing the house, I decluttered my car, my computer, and so much else. Around May, I turned my attention to the storage unit I rented for my parents’ possessions after selling their house. I thought I’d start with family photos and brought home three plastic tubs of them. Although I had the best of intentions, when the warm weather set in, my attention was drawn away from the photo tubs, and they remained in the corner ever since. A couple weeks ago, I was overtaken by the urge to clutter-clear once again. Only there wasn’t much to declutter because I’d already done that thoroughly and haven’t reverted at all because I got to the heart of my relationship to the clutter and addressed it at the core. The way it felt after decluttering motivated me to prevent the creation of new clutter. However, the three boxes in the corner called to me, so I rolled up my sleeves and got started. I began with photographs of my paternal grandfather and his family of origin and pulled out the family tree he drew up for me in his impeccably neat handwriting. As I cross-referenced old photos and relationships with the family tree, it occurred to me that it was February 19th: my grandfather’s birthday! He would have been 111. I celebrate my mom’s and grandmother’s birthdays by making their signature recipes, and going through old family photos with the family tree close by seemed like the perfect way to spontaneously celebrate my grandfather’s birthday. What a great way to kick off this new round of decluttering! I spent the morning going through lots of pictures from his life and wrote names on the back of any pictures that didn’t have them already. My grandfather was the eldest of 12 children. He and one of his brothers emigrated from England to Schenectady, NY in 1921, when my grandfather was 14, to live with their grandfather, who came over several years prior. My grandfather only has one living sibling: his youngest brother, Ralph, in British Columbia. I adore my great-uncle Ralph and his wife and children (who are around my age) and put the mystery photos in a pile to scan and email to Ralph. He has helped me to identify many of them, with background information about where the pictures were taken and on what occasion. That afternoon when I drove to work, I turned on the radio to the local NPR station when the historian for the city of Schenectady was being interviewed. The synchronicity made me feel even more connected with my grandfather on his birthday. I love it when things like that happen! As I would find out later, there was an abundance of historical pictures, articles, and artifacts about Schenectady amongst my grandfather’s and father’s belongings. That was 13 days ago, and since then, I’ve gone through all three boxes of photos and 15 more containing photos, papers, cards and letters, and mementos! I’m on a roll, and it feels amazing! I sort the pictures into plastic tubs assigned to my son, my daughter, my siblings, and myself. There’s also a tub that contains ziplock bags for other relatives, mostly cousins. If a photo shows more than one of my siblings, I put it in a general box of photos to scan and digitize so everyone can have a copy of the digital library I’m compiling. It feels great to create boxes of photos for each family member, which I intend to give as Christmas gifts this year. I have no idea how many more boxes of photos I’ll find in the storage unit, but it will get done one box at a time. The biggest takeaway so far is to be sure to write names on the backs of photos! I’m taking time to do that now. Thank goodness my great-uncle is around to help me identify people on my dad’s side of the family. Some photos mailed from England say things like, “There I am in the middle!” But who is “I”??? A couple days ago, I went through the biggest plastic tub of photos yet. Inside it was a really old photo album that seemed like it must have been stored for decades in the deepest, darkest, dampest depths of my parents’ basement. It was my mom’s photo album from her early twenties, before she met my dad. There were photos of old boyfriends (including one I believe she was engaged to), cards, postcards, etc. These were the “missing years” of my mom’s life about which I knew very little. What a treasure! One of her best friends from those years synchronistically searched for my mom online and found her via a Facebook page I created for her when she was languishing four years ago. That friend, who hadn’t seen her in 25 years, showed up a day or two before my mom died, and we sat around her hospice bed listening to her share stories from when they were young women. Although my mom wasn’t able to participate in the conversation or even open her eyes, it was a great blessing to have her bestie from way back when show up when she did. And now, I have pictures from that time period! The difference between decluttering my stuff and decluttering my parents’ stuff is that they held on to things related to me that I wouldn’t choose to keep. And so I found myself face-to-face with images of (and letters from) former selves I felt rather ashamed of. There were many pictures in which I clearly had an attitude. Why did I have to be such a sulky, stick-in-the-mud kid when my parents were so sweet? I even found a printed email my sister wrote to my dad 20 years ago telling him what a wonderful dad he was. She wrote that I probably think so, too, but have been so critical towards everyone lately, not just him. Yikes! I wish I hadn’t been like that – so serious, critical, perfectionistic, easily offended, and emotionally distant – and got a little stuck in regret. I had to take a deep breath and remind myself that’s not who I am now, and there was a reason for everything. Eventually, I’d work my way through it and find peace. When another wave came along, I’d do it again. Nothing like getting a glimpse of yourself from the perspective of your family members! Sometimes a “healing crisis” can arise if you do a lot of decluttering at once. When that happens, you need to slow down and take some time to ground yourself and process what’s coming up. Take a break. Take a walk. Get together with friends. Remember who you are now and who you are in the process of becoming. Allow yourself to let go of former identities that no longer serve you, and acknowledge how much you have grown and transformed since then. Find a way to send love and acceptance to your former self – or to your current self if you feel you’re not measuring up to the great potential you had earlier in life. It’s all an invitation for greater love and self-acceptance. The most difficult photo album was the one from my parents’ last trip to Hawaii in the fall of 2012. They looked so happy and had no idea they would return home to news that would devastate them. A few months later, my dad had a heart attack, and a year after that, my mom was undergoing chemo and had begun her decline. That Hawaii trip was probably the last time they were truly happy before the series of unfortunate events. However, I don’t know what their souls came here to learn, so perhaps the events were just part of their path and their curriculum here on earth and not so unfortunate after all. And perhaps having me for a daughter was part of that, too. The most fascinating box so far was a huge, heavy one I opened last night from which a strong, musty odor arose. I covered my nose and mouth with a mask to sort through that one. 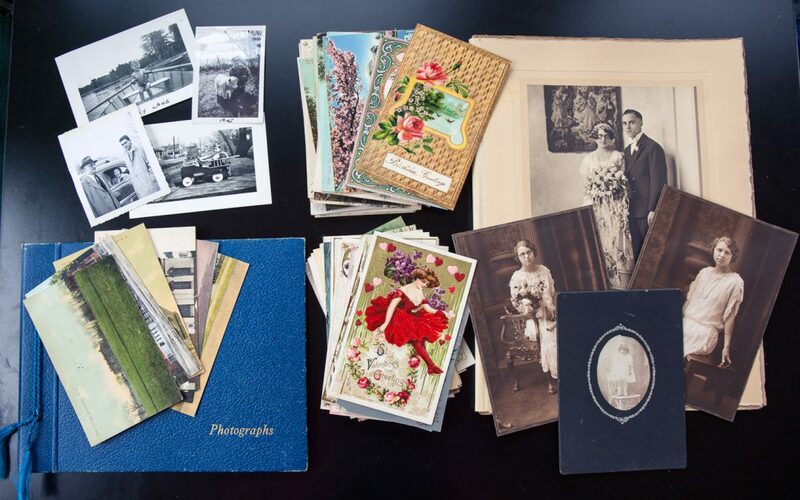 My great-great grandfather’s postcard collection (received mostly from his daughter and granddaughter – my grandmother) were among the artifacts, along with numerous, old photo albums from my dad’s childhood. I also came across a mysterious object that looked like the lid to an old, ornate box. As I worked my way through the box, I found a matching, bejeweled piece that was the front cover of a huge Bible, followed by an enormous text block that had become detached from its covers. That Bible must have weighed at least 15 pounds! It was the sixth family Bible I have come across, and along the way, I’ve learned how to dispose respectfully of Bibles in various conditions. The simple Bible that belonged to my great-grandfather on my mom’s side was the one I discarded most ceremonially. It seemed to have the most energy and contained numerous notes, newspaper clippings, photos, cards, obituaries, etc. There were several pages missing, so I couldn’t donate it. I removed all the artifacts and cut out the pages in the back where important family events were recorded. Then I lit a rose-scented candle and sat down to meditate on how best to dispose of the Bible. Options included burning, burying, and recycling. I ended up recycling it. I gently and lovingly removed the text block from the (non-recyclable) covers and put it inside a brown envelope on which I wrote some words that expressed my intention to release it honorably and with gratitude for how it has served my family through the generations. Doing that felt right and complete. I honored my ancestors and their faith and felt connected with them. It was quite beautiful. There were other artifacts besides Bibles that I’d choose to discard. I put some of the more interesting ones aside to photograph prior to getting rid of them. The stuff I’m sorting through brings up insights about my parents and ancestors, and I’m taking pictures and journaling about those insights rather than holding on to all the stuff. I’ve sorted through thousands of photos now and disassembled at least 25 photo albums and upwards of 50 framed photos. I’ve also thrown out lots of photos and have developed a system for sorting and discarding. Pictures of unfamiliar people and vacation photos ended up in the garbage because they don’t have meaning to anyone now. As I looked through my parents’ vacation photos of scenic landscapes, I paused to feel the joy they must have experienced under a spectacular Hawaiian sunset sky, for example. It felt like joy was being transmitted directly through the photos. I kept some of them, but there’s no need to hold on to most of them because the stories and context are lost. Attuned to intuition, I feel very clear about which photos to keep from a batch of vacation photos and which ones to let go of. I also am recognizing the sentimental value of portraits taken by professional photographers (like myself). I’m convinced my parents have held onto every photo, note, and piece of paper that ever made its way into their home! But I still haven’t come across any of my journals from when I was in junior and senior high school. My younger sister told me she’d found them after I went off to college, and she and her friends read them for entertainment…which was terribly embarrassing! I wonder what happened to the journals and shudder at the thought of my parents finding and reading them – exposing my innermost thoughts and experiences during the time I put up such an emotional shield between myself and my family. My sister seems to think they are long gone, and I’m actually okay with that! Anything designated for a yard sale goes back in the storage unit with a price sticker on it. So one box at a time, I shall proceed with this decluttering pilgrimage. Eventually, I’ll get to the end of the pictures, papers, and mementoes, which I imagine will feel like successfully clutter-clearing a room in my house. Then I’ll move on to another category, like household, kitchen, books, etc. It’s going to take a while…but one box at a time. © 2018 Susan Meyer. All rights reserved. To use any or all of this blog post, include this exactly: Susan Meyer (River-Bliss.com) is a contemplative photographer, writer, educator, and artist who lives on the Hudson River. Her work combines her passion for photography and writing with her deep interest in the nature of mind and perception and her love of the natural world.